..: Consultancy Projects - Pharmaceutical Industry : Application of CFD to Laminar Booth Design :..
Design principles for containment equipment are not new. The early nuclear and biological industries had to develop safe systems for handling very hazardous materials. 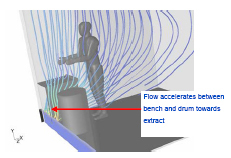 Figure 1: Geometry of laminar flow booth. As the manufacture of ever more potent and toxic pharmaceuticals grows, so does the need for employee and workplace protection. Rose Consulting Engineers Limited (RCEL) have applied their experience from the nuclear industry to the design and development of such laminar flow booths, using Computational Fluid Dynamics (CFD). Figure 2: Velocity coloured pathlines. 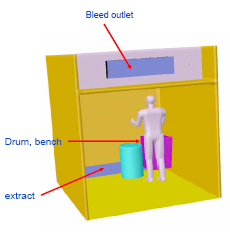 Figure 2 shows the distribution of air velocity around an operator stood in front of a work bench and drum. The work bench is a unique design, having perforations in the top and side surfaces. The pathlines are coloured by velocity and can be seen to pass, undisturbed, through the top of the work bench and also accelerating between the bench and the drum. A good design needs to keep the booth atmosphere clean but not interfere with the process operations. These results show the flow to descend smoothly past the operator and through to the extract. CFD allows the designer to interrogate the internal flows for any unwanted turbulence or dead spots.